The social media events season is again upon us. It’s going to be an exciting Fall for me, as I hit the road to talk about The NOW Revolution and other aspects of social media and content marketing. If you think the social media event will be great, chances are you’ll be right. If you think it’ll be just okay, you’ll find a way to fulfill that prophecy. This is the hardest part of social media events programming. I do not envy event organizers, because invariably you have attendees at all points of the social media experience spectrum, and providing great content for all those points is tricky. The reality is that there isn’t a damn thing you’ll learn at a social media event that you couldn’t learn from a blog or a book if you wanted to work that hard. What makes event-based learning worthwhile is the in the flesh interactions. If you end up at an event, and don’t meet at least five people that you can help or can help you in the near-term, you’re not working the relationship angle hard enough. Where this gets particularly important is when companies send multiple attendees. If you and your co-worker(s) are going to the same event, act as though you ARE NOT from the same company. Don’t sit at the same table, don’t go to the same restaurant, and certainly don’t go to the same session. Is it less socially awkward to have Phil, your wingman from Marcom at your side? Of course. But it doesn’t do you, Phil, or your company any favors to overlap learning and relationship-building. Speaking at conferences is part of my business. It’s not the bulk of my business, like it is for Scott Stratten, who is stellar at it. 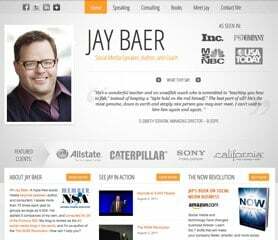 But, it’s an important part of my mix, which is why I launched the new Jaybaer.com website that focuses solely on speaking stuff. In terms of what events I recommend for the Fall, my list is therefore derived in large measure by which events I’m familiar with, which are coincidentally the events where I am speaking. A note on that: I do not speak at events (even for money) that I don’t believe in, as I do not lend my name to help profiteers sling social media and content marketing hokum. Thus, if I’m speaking, you may infer that I endorse the event wholeheartedly. Here’s the public events where I’ll be, and hopefully I’ll see you at one or more of these. If you have any questions about events, promo codes, etc. please put them in the comments. My man Joe Pulizzi is putting on a SHOW at the first-ever Content Marketing World conference. For a debut conference, it may be the best lineup I’ve ever seen. Exceptional mix of gurus, authors, and corporate types, with very focused tracks (see #2 above) so you can pick your learnings logically. Plus, there’s an event at the Rock and Roll Hall of Fame, and a keynote by THAT Kevin Smith, AKA Silent Bob. Pure content awesomeness. Use promo code SPKRGST and save $100. I’m doing a session on Content Marketing Metrics, and a 7-minute burst session at lunch, where I’ll be trial ballooning some concepts for my next book. Held at the hotel adjacent to the Arizona Cardinals’ football stadium, where I formerly spent 10 Sundays each year, New Media Optimization Summit offers an outstanding mix of keynotes and hands-on workshops. Excellent content spread too, as you’ll find sessions covering the holy trinity of modern online marketing: content, search, and social. I’m excited to see Scott Stratten, Chris Penn (who never fails to amaze), Arnie Kuenn, Shashi Bellamkonda, and the brilliant and inspirational Geno Church from Brains on Fire. I’m doing the opening keynote on The NOW Revolution, and then a trends in new media panel over lunch. What started out as a humble (well maybe not humble, but focused) email conference many years ago has morphed into the best run interactive marketing conference in the land, in my estimation. And I’m not just saying that because they’re a client. The ExactTarget Connections event features truly world-class speakers (this year includes Soledad O’Brien from CNN, Jimmy Wales who started some small thing called Wikipedia, and Stan Lee, who is a living comic book legend), big-time entertainment (Katy Perry), and a ton of very specific, tactical sessions on email, SEO, content marketing, social media, mobile. Even if you’re not an ExactTarget customer, and even if you’re not in the email space at all, it’s a heck of a good conference. I’m doing a session on The NOW Revolution, a consolidated version of that as a burst session, and a special session on ExactTarget’s new Facebook page application. You want more meat, less bun? Welcome to the king of meat. Marketing Sherpa events are focused, information-rich, and driven by case studies and REAL DATA. You’ll see big companies showcasing actual results. If you’re in lead gen, inbound marketing, or anything B2B check out the Marketing Sherpa B2B Summit. It’s not social media heavy per se, but there are a few social sessions. Actually, Facebook Success Summit (and its brethren the Social Media Success Summit and Blogging Success Summit) are perhaps my favorite events of the year, because they are 100% virtual (no planes!) and are exceptional values for the money. There are 16 live Webinars during the Facebook Success Summit, and you can attend any or all or none of them during their time slots. If you miss a live version, registrants get access to the recordings for one full year. Sweet. The lineup this year is pretty insane. I seriously think I might be the weak link. Guy Kawasaki. Mari Smith. Robert Scoble. Paul Dunay. Ekaterina Walter. Mike Stelzner. If you’re serious about Facebook for your business, this is pretty much a must-do in my estimation. Tightly focused sessions from people who have been around the block with FB. The whole show is just (for now, price goes up soon) $297, and you get free bonus access to 16 other Webinars, for 32 total. I’m doing a session on Killer Integration of Facebook and Email. Use this (affiliate) link to lock in your $297 price, and I make a couple bucks, too. Thanks. If you own or manage an advertising, marketing, or PR firm with 100 employees or fewer, you REALLY need to go BOLO 2011. It’s a first-class operation, dedicated to teaching small and medium sized “traditional” agencies how to understand and profit from “digital” marketing. I’ve spoken at BOLO the last couple years, but this year’s lineup is astounding for such a cozy event (they keep the numbers to 200-ish to keep the intimacy high). You’ll find that Scott Stratten rascal again, Kelly McDonald, CC Chapman, Michael Gass, Facebook stats wizard Jeff Widman, and a bunch of other amazing people. Use promo code JBaer to save $100. I’m doing the Social Media Super Session with Tom Martin and Tim Hayden. There. Will. Be. Tequila. It’s the biggest conference in the world of public relations, with dozens of sessions covering every aspect of the industry. Essentially, PRSA International is like South by Southwest, but instead of lip rings and iPhones you’ll find Blackberries and Manolos. Me and my book spouse Amber Naslund are co-presenting The NOW Revolution. See above. Same premise. Many different speakers. More of a tech focus, given the location. Equally awesome. I’m doing the keynote again at this version of Marketing Sherpa B2B Summit, and everyone gets a book again. Yea! It’s what SXSW was before it got out of hand. Simply the largest concentration of social media talking heads and corporate types in one convention center. Blogworld has terrific content, especially for advanced social practitioners, as presenters know they’ll be speaking to their peers in many cases. This is the first time the event has been in LA (previously, Vegas), so it will be interesting to see how that dynamic affects the show. I also really like Blogworld because you get to interact not just with the social media blogger community, but all the other bloggers out there. It’s like the Star Wars cantina scene. You’ve got your military bloggers, your mommy bloggers, your daddy bloggers, your foodie bloggers, your religion bloggers, your politics bloggers, and a bunch more all in the same facility. If you can’t find someone interesting to talk to at Blogworld, the problem my friend is with you. I’m also fired up because Amber is keynoting. That should help sell some books. Opening keynote from Peter Shankman. 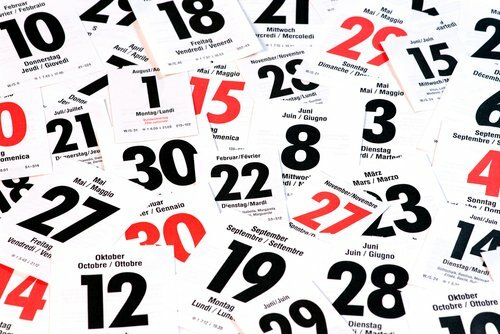 Which of these events are most interesting to YOU?